The crisp, clear spring morning greeted the pilgrims pleasantly as they approached St. Nicholas Serbian Orthodox Church in Steelton, PA. The goal was to grow in Christ through education and prayer. 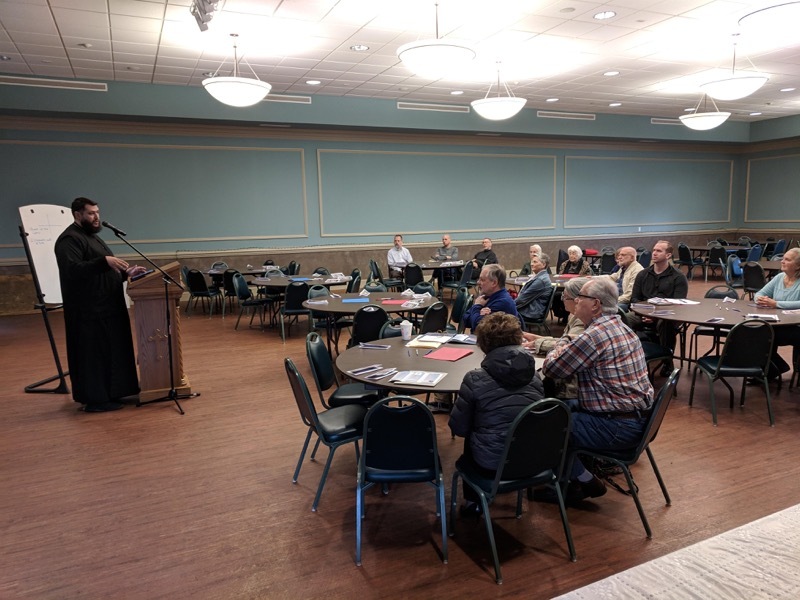 Father Christopher welcomed around 20 faithful from the Harrisburg area to a retreat entitled: The Arena -The Battle of Great Lent. Fr. Theodore Paraskevopoulos, priest-in-charge at Sts. Constantine and Helen in Toronto, ON, CA, is a graduate of the Toronto Orthodox Theological Academy (Under University of Sherbrooke) where he received his Bachelor degree in Theology. 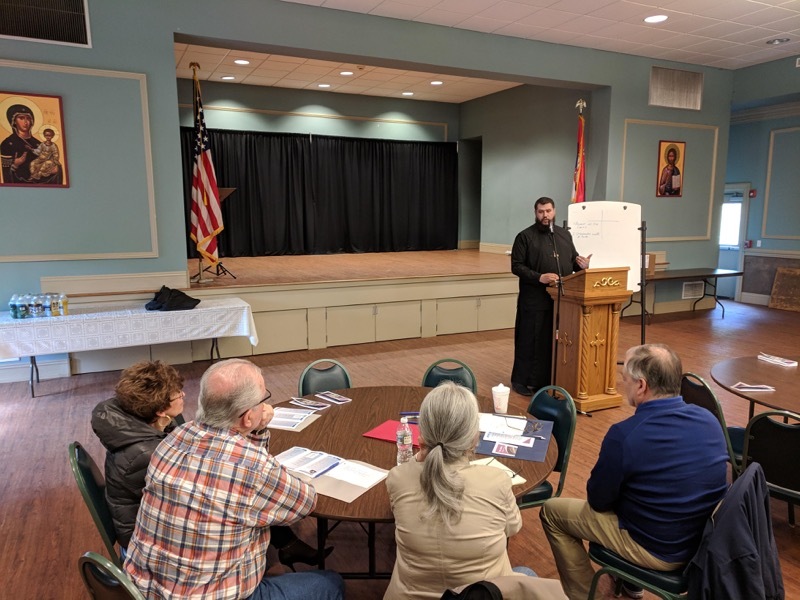 He then continued his education at St. Vladimir’s Orthodox Theological Seminary, in Crestwood, New York, where he received his Masters of Arts in Theology with a specialization in Liturgical Theology. The arena of the virtues has been opened. Let all who wish to struggle for the prize now enter, girding themselves for the noble contest of the Fast; for those that strive lawfully are justly crowned. Taking up the armor of the Cross, let us make war against the enemy. Let us have as our invincible wall the Faith, prayer as our breastplate, and as our helmet almsgiving; and as our sword let us use fasting that cuts away all evil from our heart. If we do this, we shall receive the true crown from Christ the King of all at the Day of Judgment. Each section of the retreat examined a portion of this hymn. The Armor of the Cross shows how we must deny the self and crucify our will to defend against the wiles of the enemy. The invincible wall of Faith shows it is only possible to protect ourselves through trusting in God. The breastplate of Prayer is used to continuously guard the heart from the darts of the enemy. The helmet of mercy/charity/almsgiving helps to defend our minds from evil thoughts by focusing on helping our neighbor. The sword of fasting--the only offensive weapon--helps to cut away evil desires by controlling our will through controlling our appetites. We give thanks to God for Fr. Ted, our pilgrims and for the wonderful opportunity to grow in the Faith!